You guys, this week has been like whoa. Two shoots, a baby shower, four batches of chocolate cupcakes, and everyone on spring break. Bouncing between stay at home mom, work at home mom, and work away from home mom has got me in a perpetual game of catch up. I am so glad that I have nothing on the schedule next week, because I need to get back in balance. I haven't been great about updating the blog regularly, but hopefully you're following Stir & Scribble's adventures on Instagram? The last couple of months have been a fun journey into eating a more whole foods based diet. If you've been a follower for very long - you might have noticed that I've had many false starts and stops at feeding my family a less processed diet. This time though I've had help. In February, I signed up for a program with Prescribe Nutrition. Prescribe Nutrition is a team of incredible woman with one incredible goal - to get you to give up a 'diet' in favor of eating real whole food. There programs are designed to shake you free from the standard American diet in a fun, approachable way with a ton of support and community. I loved my Prescribe experience so much that I shared my story over on their blog this week - you can read all about my disdain for diets here. This weekend I'm jumping into another program with the Prescribe Nutrition team - Prescribe Balance. Prescribe Balance is perfectly timed to kick off spring. Twenty days of digging deeper into eating whole foods, getting some exercise, and daily cleaning rituals with the goal of getting everything back in balance. I couldn't need it more right now - care to join me? Use the code 'stirandscribble' for 20% off! There's still plenty of time to sign up! This Chili is one of the recipes from Prescribe Balance and a great example of whole foods meets comfort food that is typical of the Prescribe Nutrition team. 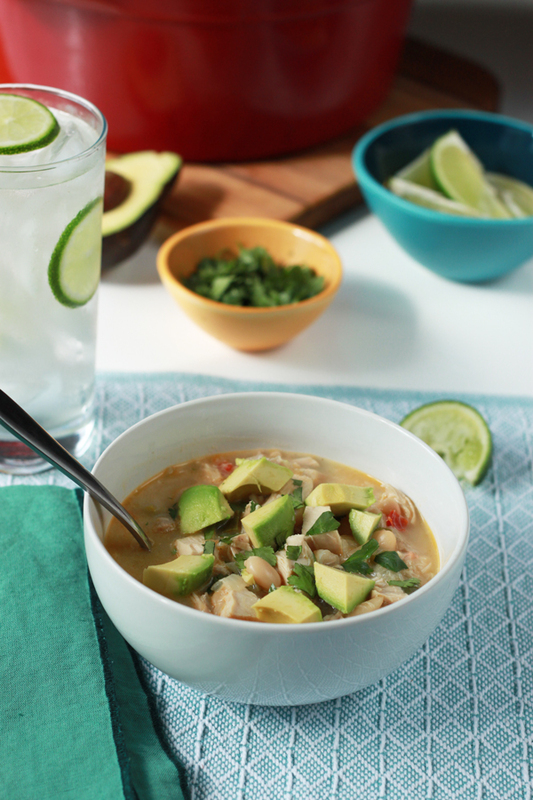 We scaled back the spice for Ella and served it with a ton of lime and avocado. 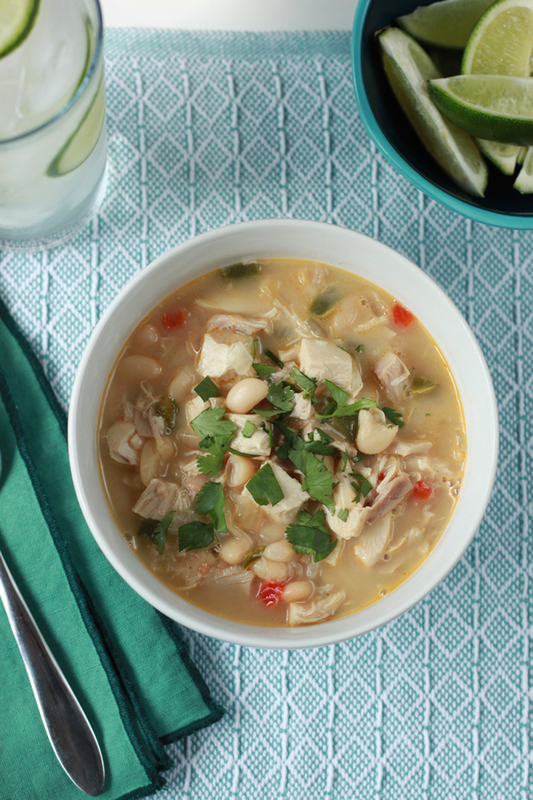 Its the perfect Sunday supper (and great for lunch leftovers). *only include if you prefer some extra spice in your chili! Heat the oil in a large heavy bottom pan or dutch oven over medium heat until hot. Add the onions, peppers, cumin, coriander, chili powder, paprika and 1⁄2 teaspoon of the salt. Cook until the vegetables have softened, about 5-6 minutes. Add the garlic and sauté for another minute. Pour in the broth. Add 1 can of the beans and, using a potato masher (or a handheld blender), mash the beans in the pot, creating a thicker texture. 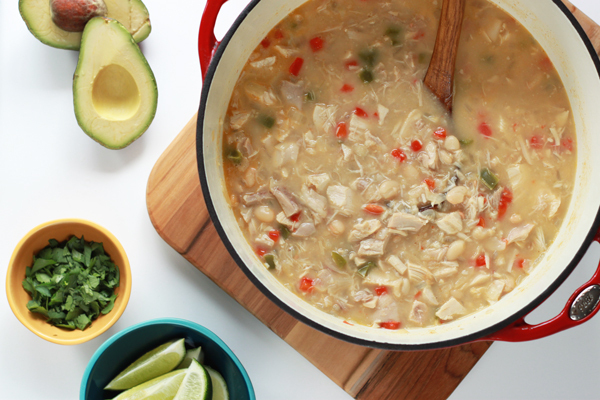 Stir in the remaining beans, shredded chicken, lime juice and zest and bring to a boil. If you prefer a chili with more broth, add 1 - 2 cups of water. Reduce heat to low and simmer for 20 minutes. Stir in the coconut milk and keep on a low simmer for 5 minutes. 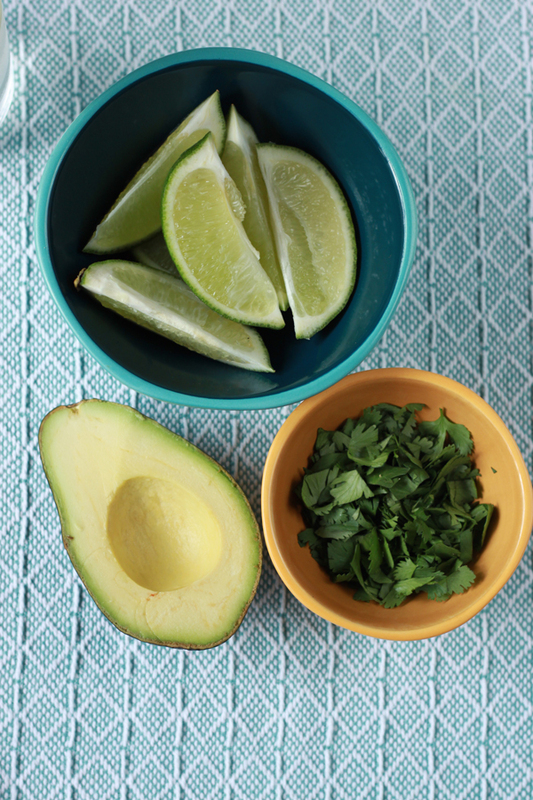 Serve immediately with additional lime wedges and cilantro.